I am always looking for fun, new breakfast ideas. My standard breakfast is oatmeal at my desk, so when I have a reason to do something special for the morning meal I look forward to trying something new. Recently I hosted an open house and invited some girlfriends over to sip mimosas, have a bite to eat, and shop for some great products from a friend who was in town. My goal was to serve some sort of savory breakfast item that could be made ahead of time and was easy to serve. I decided on a breakfast tart. I used my all-time favorite pressed pie crust recipe (check the link for step-by-step instructions), and added in some of my favorite flavors like bacon, leeks, and cheddar. I was thrilled with the result. Not only was it pretty, it was delicious. 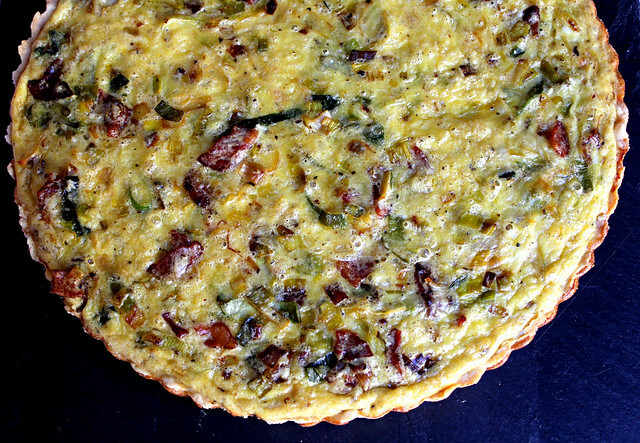 The mascarpone cheese adds creaminess to the tart and the bacon and leeks add tons of flavor. The Perfect Pairing for this tart recipe is a tart pan with a removable bottom. I wish I invented this. It is brilliant! The removable bottom allows you to remove the entire tart from the pan, which really helps with presentation. There is no way you would get a clean slice if you could not remove it from the pan first. I learned one very important lesson about using a tart pan with a removable bottom. Typically when I make my pressed pie crust recipe I mix it all up directly in the pie plate. Let’s just say this is not the best idea when liquid can leak out of the removable bottom. Oh my, did I have a mess. Not my brightest moment. All of this would be solved by mixing it up in a bowl and then pressing into the pan. Lesson learned. Preheat the oven to 400 degrees F. In a medium bowl, measure flour, salt, and sugar. Mix ingredients with a fork. In a measuring cup, make an emulsion of the oil and milk by beating with a fork. Pour the emulsion over the dry ingredients and toss until all of the flour is moistened. Press into a 10-inch tart pan with fingers until evenly distributed. Prick the bottom of the crust with a fork in several places. In a small bowl, lightly beat one egg white (reserve the yolk for the tart). Using a pastry brush, coat the crust with the egg white. 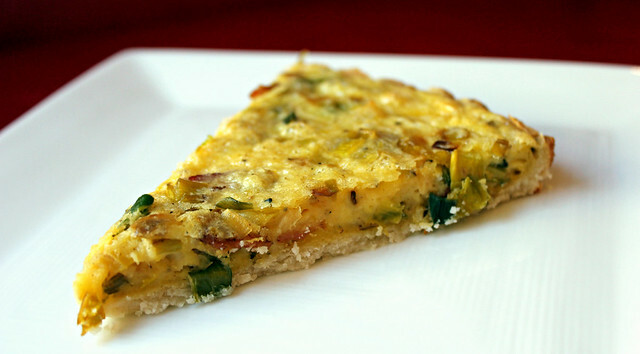 Place the tart pan on a baking sheet and bake the crust in the oven until the egg white has set, about 8 minutes. Allow the crust to cool. Meanwhile, in a large skillet, cook the bacon pieces until they are brown and crispy. Remove to a paper towel to drain. Discard all but 1 Tb of the bacon fat from the pan. Add the chopped leeks and sauté until they are softened and translucent. In a large bowl, whisk the remaining 5 eggs and the reserved egg yolk. Add the mascarpone cheese to the eggs and mix until smooth. Fold in the shredded cheese, sautéed leeks, bacon, salt and pepper. Pour the mixture into the cooled crust and bake until the center has set and the top is golden, about 18-25 minutes. Allow the tart to cool before slicing.